When running SuperQ for large datasets, it is recommended to allocate more RAM for the heap space. Otherwise an OutOfMemoryError may occur. Heap space can be increased using the Java VM options -Xms or -Xmx. See Running SPECTRE Tools for more information on how to adjust these options. 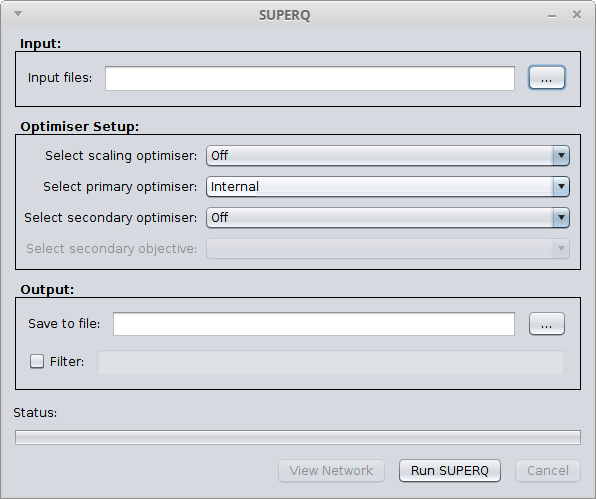 The supernetwork constructed from SuperQ can be visualised in the SPECTRE Viewer. Grünewald, A. Spillner, S. Bastkowski, A. Boegershausen, V. Moulton. SuperQ: Computing Supernetworks from Quartets. IEEE/ACM Transactions on Computational Biology and Bioinformatics, 10(1): 151–160, 2013. Grünewald, K. Forslund, A. Dress, V. Moulton. QNet: An Agglomerative Method for the Construction of Phylogenetic Networks from Weighted Quartets, Molecular Biology and Evolution, 24(2): 532–538, 2006.